Crusaders will host Coleraine in the first post-split fixture on Tuesday 3 April. The Danske Bank Premiership is approaching the post-split stage with one game left to play. Warrenpoint host Dungannon Swifts on Saturday but neither team can move positions in the table and so the post-split fixtures have been finalised via Monday evening's results. 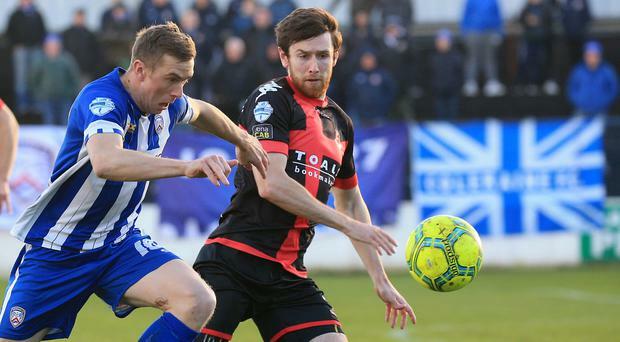 Crusaders sealed top spot going into the split when they smashed Warrenpoint Town 4-1 while Ballymena beat Glentoran into the top six thanks to their win over Ballymena United. Before we go through the fixtures, here is the number of home games awaiting each team in the final five: Crusaders 4, Coleraine 2, Glenavon 3, Linfield 3, Cliftonville 1, Ballymena United 2, Glentoran 3, Dungannon Swifts 2, Ards 4, Warrenpoint Town 2, Carrick Rangers 1, Ballinamallard United 3.